Thanks to everyone who entered the $150 Mother's Day Giveaway from Ebates! The randomly selected winner is Joelle C., congratulations! You will receive $150 from Ebates. 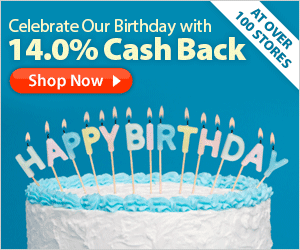 Celebrate Ebates 14th Birthday with 14% cash back at some of our favorite stores, including Ebags for a great deal on Vera Bradley bags!